Recently, we soft launched a new format for the Disneyland Resort Update. The content categories and their order remain relatively the same, but now with an enhanced, refreshed look. The new light green button at the top of the Update lets readers quickly skip ahead (jumping over introductory comments like this) by way of a drop-down menu. Clicking on a major section heading, highlighted in light green will take you to the next one with a click, and the last one will take you back to the top. Each of the News items highlighted in light blue will do likewise. There are some other format changes you'll find along the way, and a few more may come along in future weeks. If you encounter an error or problem, please let us know by email, including as much detail as you can about the error (such as your browser and operating system). HEADLINES AUTOMATICALLY GENERATED HERE ON PAGE LOAD! The Dapper Day Spring Outing to Disneyland is scheduled for this weekend, with a two-day Dapper Day Expo at the Disneyland Hotel on Saturday and Sunday. This popular event grows larger each year, so it's worth taking note if you plan to visit the parks this weekend. While the event's official in-park day is Sunday, April 14, expect Dapper crowds as early as Friday as people make a long weekend of the party. The Dapper Day Expo takes place at the Disneyland Hotel from 11:00 a.m. to 7:00 p.m. on Saturday and Sunday. A twl-day pass with an event button is $12.50 (children 12 and under are free). You can get a free cocktail upgrade by showing your event button on April 13 and 14 at Catal, Uva Bar, Tortilla Jo's, or Naples Ristorante. Dress to Impress – Now through April 14, the first 50 guests to show their pre-purchased Disneyland or Dapper Day Expo ticket at Simon Guest Services, located near Adidas, will receive a $25 American Express Simon Giftcard to shop. Dine in Style – Guests that attend Disneyland’s Dapper Day and/or Dapper Day Expo will receive 20% off dinner at several of The Outlets at Orange’s most popular restaurants, including BJ's Restaurant & Brewhouse, Dave & Buster’s, Johnny Rockets, and Lucky Strike. Valid April 13 and 14 with proof of attendance. You can find more information and a schedule of Dapper Day Expo seminars, entertainment, and presentations at the event website. 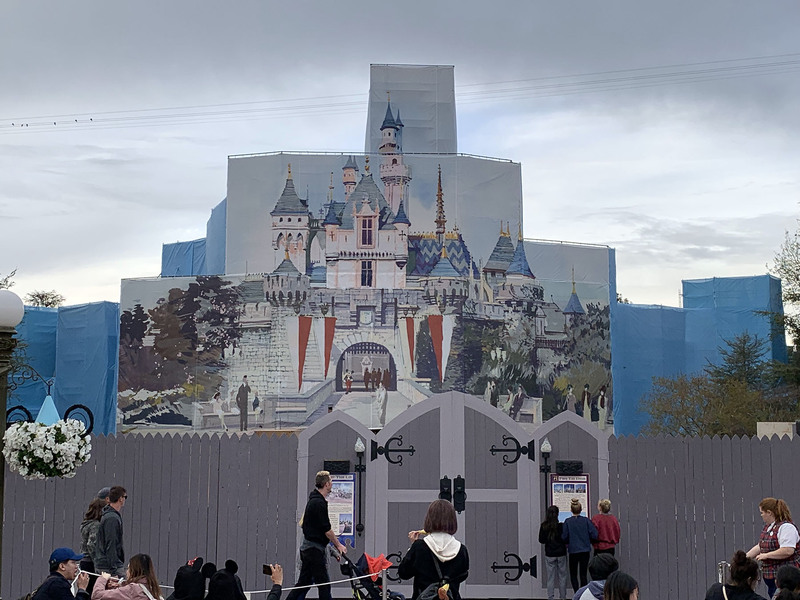 As the refurbishment of Sleeping Beauty Castle continues, some portions of the castle walls are now visible, and show off the new paint scheme chosen for the refresh. 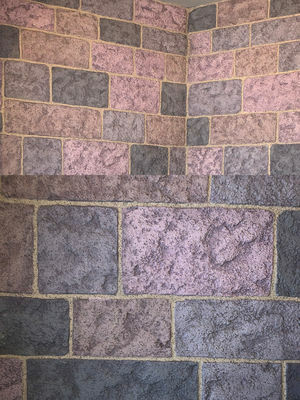 The new colors lean towards warmer tones of pink, lavender and gray, and do not have the same shimmer as the older blue/gray/silver section. Sleeping Beauty Castle is still under wraps during refurbishment, but progress is visible on some sections of wall. Photo by Adrienne Vincent-Phoenix. 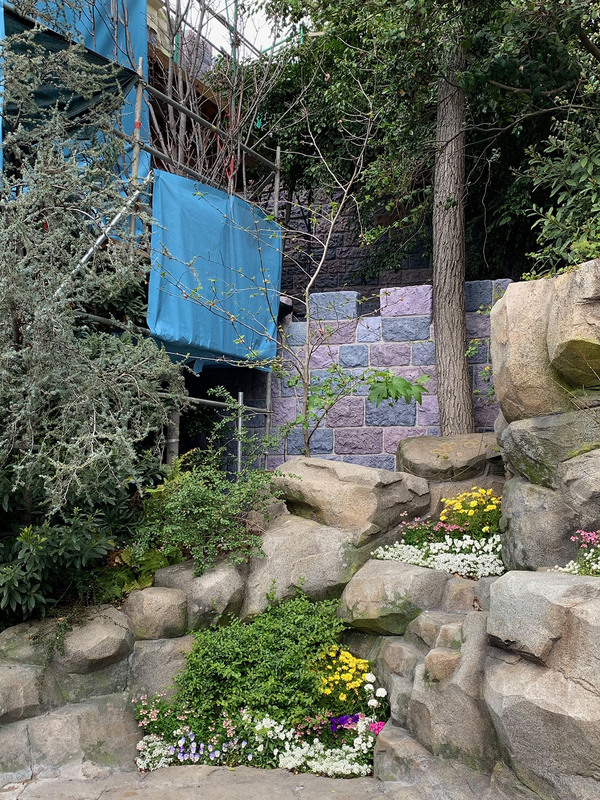 A section of the castle wall visible near Snow White's Grotto shows the new paint scheme. Photo by Adrienne Vincent-Phoenix. 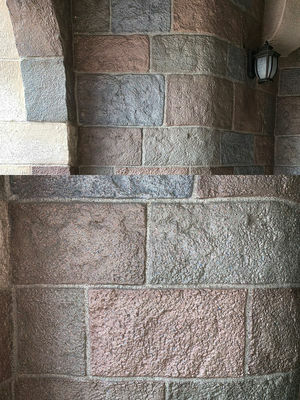 One of the castle walkways is still painted in the old tones of silver, gray, blue and taupe. Photo by Adrienne Vincent-Phoenix. 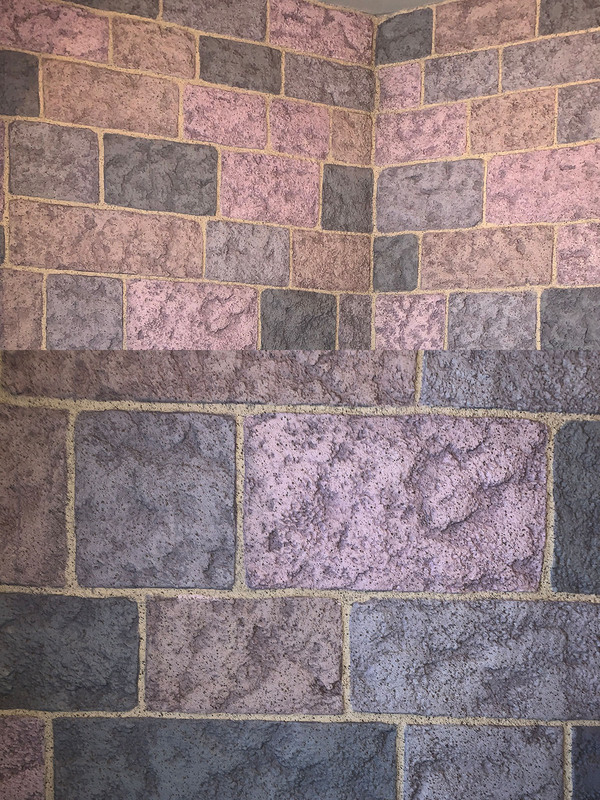 A newly painted section shows warmer colors of pink and lavender mixed with shades of gray Photo by Adrienne Vincent-Phoenix. The walkway around Central Plaza is under refurbishment as Disney continues to remove curbs from the high-traffic area. Photo by Adrienne Vincent-Phoenix. With tickets still available for both of the Disneyland After Dark: Heroes Assemble events scheduled in three weeks, Disney has released additional information about what guests can expect at the after-hours parties. Character meet-and-greet opportunities are a big draw of these events, and Disney has confirmed that Captain Marvel, Doctor Strange and Iron Man will be on hand for photos. The event ticket includes unlimited PhotoPass downloads of photos taken at the event. Actress, author, and Her Universe founder Ashley Eckstein will also participate in a meet-and-greet during the event. The event takes place at Disney California Adventure, and most major attractions will remain open for the evening. If you've had your fill of Guardians of the Galaxy – Mission: BREAKOUT!, you can participate in a new scavenger hunt created for the night. Select food and beverage locations will serve special menu items, and the elusive Infinity Gauntlet Sipper Cup will be available for sale again during the event. The parties are Tuesday, April 30 or Wednesday, May 1. These events take place at Disney California Adventure, the future home the Super Hero-themed land Disney has said will open in 2020. Tickets for the events are $109 per person. Visit the event website for more details and to purchase tickets. The 2019 Taste of Downtown Disney event is scheduled for Thursday, September 5. This annual fundraiser benefits CHOC Children’s Hospital in Orange County. The event is organized as a progressive dinner, and allows attendees to sample dishes and beverages from a variety of Downtown Disney tenants. Since the 2018 event, Downtown Disney has welcomed Ballast Point Brewery and Salt & Straw Ice Cream, so there may be some new treats for regular attendees to look forward to. Event details, including ticket prices and package options, will be released at a later date, and we'll share them as soon as we learn of them. Registration is now officially open for the 2019 CHOC Walk in the Park, to be held Sunday, August 11 at the Disneyland Resort. Team MousePlanet will return for our 12th consecutive walk to support Children's Hospital Orange County. Thanks to the efforts and generosity of our readers, Team MousePlanet has raised over $75,000 for CHOC since 2008. We invite MousePlanet readers, friends, and family members to join our team for the event. When you register for the event, you can opt to donate directly or fund-raise the registration fee. Early Registration – walkers can opt to pay nothing at the time of registration, but must donate or fund-raise a minimum of $85 by Monday, July 29 to participate. Late Registration – walkers pay a fee of $95 at the time of registration to secure their place at the walk. COMMUNITY! Walking with Team MousePlanet is a great way to spend a morning with MousePlanet staff and readers, all while raising money for a great cause. Stay after the walk and enjoy Disneyland with your fellow Disney fans. CONVENIENCE! If you register during Early registration and meet your fundraising goal, Team MousePlanet will handle check-in for you. No need to drive to check in the week before the walk to collect your wristband and T-shirt. You need only meet us in Downtown Disney the morning of the walk to collect your goodies, then head right into Disneyland to start the walk. If you prefer to have your shirt and wristband before the walk (some people like to personalize them), there is an option to have those items shipped to you. The deadline to join Team MousePlanet and meet the $85 fundraising requirement in order for us to handle check-in for walkers is Monday, August 5. We still welcome those who register after this date, but they must handle their own check-in. In addition to helping support an outstanding local charity, one of the benefits of participating in the CHOC Walk is the opportunity to purchase specially priced Disneyland tickets to use in the weeks after the walk. CHOC has not yet announced the dates or details this promotion for 2018; we will share details as soon as we know them. Are you ready to CHOC Walk with Team MousePlanet? It's easy to sign up—just visit our team page. ...The refurbishment of the Astro Orbiter in Disneyland's Tomorrowland was extended through April 15. 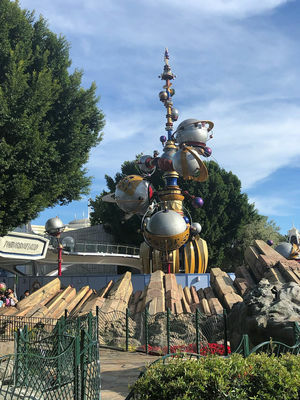 Disneyland visitors will have to wait another week to ride the Astro Orbiter. Photo by Todd Pickering. ...The very popular Egg-stravaganza event is on now through Easter Sunday, April 21. 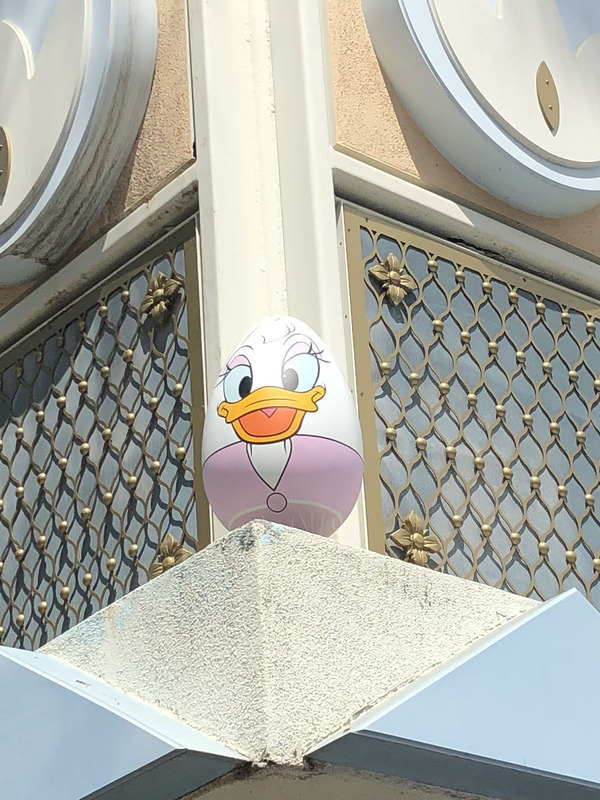 There are three egg hunts again this year, one each inside Disneyland, Disney California Adventure, and Downtown Disney. A dozen oversized eggs decorated with images of Disney characters will be placed around each of the three hunt locations. Egg hunters first purchase a special map and stickers ($6.99) to help locate these eggs, then place the stickers on the corresponding spots on the map to earn a prize—one of six different two-inch-tall "eggs" featuring all-new character designs for the 2019 promotion. Here's one of the 36 oversized Easter eggs you can spot around the Disneyland Resort. Photo by Todd Pickering. Without giving away too many spoilers, we've found that some eggs are much harder to locate than in past years, offering a greater challenge to veteran hunters. Happy hunting, but remember—if you are only in it for the collectible eggs, you don't need to complete the egg hunt to claim your prize. Just buy your map at a redemption center and receive your egg on the spot. ...Salt & Straw Ice Cream released its seasonal flavor menu for April. At its Downtown Disney location, the line-up includes Rhubarb Crumble with Toasted Anise, Wildflower Honey with Ricotta Walnut Lace Cookies, and a vegan Orange Blossom Sorbet with Edible Flowers. ...Disneyland has released two brand-new souvenir collectibles to coincide with the theatrical release of Dumbo. The Dumbo souvenir sipper cup is $16.99, and includes your choice of beverage at the time of purchase. A smiling Dumbo sits in a Casey Jr. Railroad circus car. The Casey Jr. engine popcorn bucket is $17.00, and comes with a scoop of popcorn at the time of purchase. The two pieces connect to form a charming display that will take up entirely too much room on your desk, but will make you smile every time you see it. 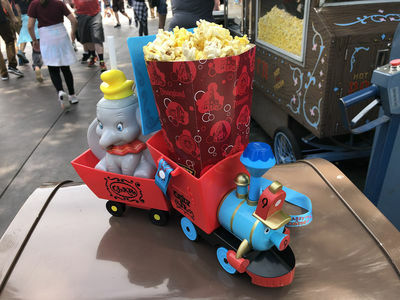 The Casey Jr. Railroad snack set is the latest collectible available at Disneyland popcorn and drink carts. Photo by Todd Pickering. ...Reservations are open for the new brunch with the Easter Bunny at Catal restaurant in Downtown Disney. The family-style breakfast event at Catal features a photo opportunity with the Easter Bunny, bottomless mimosas for adults, and an apple cider cart for children. Each child receives a personalized Easter basket and a stuffed bunny. Brunch is served between 9 a.m. and 2:00 p.m. on Saturday, April 20 and Easter Sunday, April 21. Tickets are $80 per adult and $35 per child ages 3 to 10. Children 2 and under are free, but must be counted in the party size. Reservations are open online via the Patina Group website. …The MousePlanet Newsletter is here! The newsletter contains a recap of the week's articles (in case you miss a day), news that may have developed since the weekly Updates were published, and tips about what's happening at the Disney theme parks for the coming weekend. We'll also include a fun bonus, such as an Eye Spy or a trivia question. To subscribe to our free newsletter, just enter your email in the box below. Note: Not all attraction closures have been officially confirmed by Disney, and are all subject to change at any time. All refurbishment schedules are estimates only. We recommend checking for updates as you plan your visit. All information is subject to change without notice. To get the most recent updates, visit DisneyWorld.com or use the MyDisneyExperience smartphone application on your iOS or Android device. New! View the different areas of the Resort by scrolling horizontally and selecting the one you want to read about. If the menu bar does not work on your screen, please let us know by email (include which browser and operating system you are using). Astro Orbitor – closed through April 15 for refurbishment. The Briar Patch (shop) – closed April 15 through May 17 for refurbishment. Sleeping Beauty Castle Walkthrough – closed through at least May 19 for refurbishment. Sleeping Beauty Castle Enchanted Chamber – closed through at least May 19 for castle refurbishment. Fairy Tale Treasures (shop) – closed May 15 through at least May 19 for refurbishment. Bibbidi Bobbidi Boutique (shop) – closed May 15 through at least May 19 for refurbishment. Cafe Orleans – closed May 6 through May 16 for refurbishment. Alien Pizza Planet – closed May 13 through at least May 19 for refurbishment. Star Wars: Galaxy's Edge – phase 1 opens May 31. The Rise of the Resistance attraction will open as part of Phase 2; date not yet announced. Silly Symphony Swings – closed through at least May 19 for refurbishment. Red Car Trolley – closed until 2020 for refurbishment. "It's Tough to be a Bug"
All of these Downtown Disney businesses closed in 2018 to make room for construction of a planned fourth hotel. Now that the hotel project in canceled, we're waiting to see what Disney does with the vacant buildings. Rinse Bath & Body Co. – first California store scheduled to open this spring. Check here to see if a large convention, competition, or park event might fall during your next trip to the Disneyland Resort. If you know of any in-park events, official or unofficial, that should be listed here, please send us an e-mail. New! Just click the year you want to expand (or close). Dapper Day Fall Outing to Disneyland (unofficial event) – Sunday, April 14. More information at the event website. 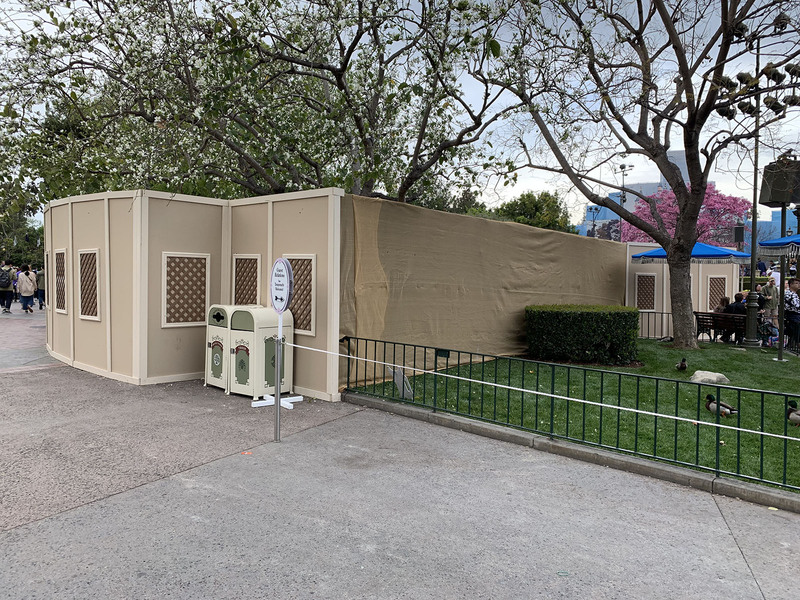 Pop-Up Disney – opens Friday, April 26 in Downtown Disney. Disneyland After Dark: Heroes Assemble at Disney California Adventure –Tuesday, April 30 and Wednesday, May 1. Tickets on sale now. More information on the event website. Bats Day in the Fun Park (unofficial event) – May 5. More information on the event website. 2019 CHOC Walk – Sunday, August 11. Thanks to the efforts and generosity of our readers, Team MousePlanet has raised over $75,000 for CHOC Children's since 2008. We invite all MousePlanet readers, friends, and family to join us at the 2019 walk—registration is open now! D23 Expo – August 23–25. Tickets on sale now via the event website. Gay Days at Disneyland (unofficial event) – October 4–6. More information on the event website. Coming Soon! When we know, you'll know! We also recommend checking the convention calendar at the Anaheim/Orange County Visitor and Convention Bureau website. When looking at that site, remember to note both the number of people and the number of rooms resulting from each convention. A gathering of 25,000 people booking few room nights (indicating most will be driving in to the area for their meeting) can impact traffic around the resort much more than a crowd of 25,000 staying in area hotels. Of course, that second group is going to make finding a hotel room more difficult (and possibly more expensive), so it's best to book your own room as early as possible if you see that a big convention is in town during your trip. Notable events at parks and attractions around Southern California. If you know of an event that should be listed here, please send us an e-mail. Disneyland prices as of January 6, 2019. Note: MousePlanet does not edit past Updates to reflect price increases; for up-to-date prices, check the most recent Disneyland Resort Update. Several current promotions offer discounted admission to the Disneyland Resort. For your convenience, we have grouped the discount offers based on the number of days the tickets are valid. Check out the category that best matches the amount of time you plan to spend at the resort, and pick the offer that works best for you. And keep those tips coming—let us know if you find a better or different offer, so we can share it with other readers! This first section is a list of discounts on ticket-only purchases. Though it has become more common in recent years, Disneyland tickets are rarely offered at deep discounts unless you are a resident of Southern California or Northern Mexico. For residents outside that area, the best discounts available tend to be simple advance purchase discounts. If you know of any additional discounts, offers, promotions, or contests that should be listed in this section, drop us a line. Note, we are no longer listing offers from the Anaheim-Orange County Visitor & Convention Bureau, as their convenience fee negates any savings. New! Just click the number of days or ticket type you want to view. Check the Disneyland website to see what type of ticket you need for the day you plan to visit. Seasonal pricing applies only to one-day tickets. * Limited-Time Special Ticket Offer – you must purchase tickets by May 18, 2019, and use all entries within 13 days of the initial entry. + The Limited-Time Southern California Resident – you must purchase tickets by May 20, 2019. There is no fuse on this ticket. Advance purchase Four-Day tickets – check for current discounts and promotions from Get Away Today. *The Limited-Time Special Ticket Offer is valid for travel through May 23, 2019, excluding the spring break blockout of April 14–22, 2019. The price is the same for all ages 3 and older, and each ticket includes one Magic Morning entry. You must purchase tickets by May 18, 2019, and use all entries within 13 days of the initial entry. Advance purchase Five-Day tickets – check for current discounts and promotions from Get Away Today. No longer offered by Disneyland; some travel providers may offer tickets for 6 days or longer as part of a package to international customers; residents of Canada, Australia, or the U.K. should check with local travel agencies to see what options may be available. Premier Annual Passport ($1,949) – valid at both Disneyland Resort and Florida's Walt Disney World Resort; includes parking and digital PhotoPass downloads. No blockout dates. Disney Signature Plus Pass ($1,399) – includes discounts, parking, digital PhotoPass downloads and MaxPass. No blockout dates. Disney Signature Pass ($1,149) – includes discounts and parking. Digital PhotoPass downloads are included only for renewing passholders who had the benefit on their original pass; new purchases do not include this benefit. Some blockout dates, including December holidays and other peak days. Disney Deluxe Pass ($799) – includes some discounts. Some blockout dates, including December holidays and other peak days. Park-specific blockout dates apply to all passes purchased, renewed or activated after June 2, 2018. Southern California Select Annual Passport ($399) – includes some discounts. This pass has the most blockout dates, including all weekends, December holidays and other peak days. Park-specific blockout dates apply to all passes purchased, renewed or activated after June 2, 2018. California residents can take advantage of the monthly payment plan when purchasing any but the Premier Annual Passport. Check with your employer, school or credit union to see if any other discounts are available through them. Did we miss an offer? If you know of an authorized discount on Disneyland Resort tickets, standing offers for Annual Passholders from non-Disney vendors, or other promotions which might interest our readers, please drop us a note! New! Just click the category you want to expand (or close). Purchase with purchase offers – Disneyland Resort shops frequently offer a reduced-price souvenir (often a tote bag, watch, or blanket) with a qualifying minimum purchase. These are offered at Disney-operated stores only, and selection may vary by location. Disney usually allows customers to purchase more than one of the offers in a qualifying transaction, so if you spend $40 or more you can buy both items currently available if you wish. If you're a passholder, the minimum purchase is calculated after your discount, and your discount does not apply to the promotional item. Character dining vouchers – Disneyland is no longer offering tickets or vouchers to be pre-purchased for Character Dining. You may still make reservations 60 days in advance with payment due at the restaurant. Disneyland Resort merchandise – Disneyland has once again extended the additional 20% merchandise discount offered to Disney Signature Plus, Disney Signature, Disney Premier, and Premium annual passholders, this time through December 31, 2019. All other passholders receive a 10% merchandise discount. Visit the Annual Passholder discount page for specific details and exclusions. Guided tours – 15% off the regular price of six guided tours – Walt in Walt's Footsteps; Cultivating the Magic; Discover the Magic; Happiest Haunts; Welcome to Disneyland; and Holiday Time at Disneyland. Visit the Annual Passholder discount page for specific details and exclusions. Dining – 10–15% off at a variety of Disneyland Resort locations, including Disney-owned and independent restaurants. Visit the Annual Passholder discount page for specific details and exclusions. See the Disney Visa website for terms and conditions for all of these promotions. Character meet-and-greet at Disney California Adventure – cardholders have access to a private character meet-and-greet photo opportunity at Disney California Adventure, and receive one free image download per visit. Star Wars Imperial meet-and-greet at Disneyland – cardholders have access to a private character meet-and-greet photo opportunity in the Star Tours Launch Bay in Tomorrowland. Offered daily from 2:00 to 6:00 p.m. Darth Vader is once again the character featured at this location. Disneyland Resort merchandise – Cardholders also receive 10% off qualifying merchandise purchases of $50 or more from Disney-operated retail stores. Disneyland Resort dining – 10% off at selected Disneyland Resort restaurants, (River Belle Terrace, French Market, Cocina Cucamonga, Wine Country Trattoria (lunch), Paradise Garden Grill, The Lounge at Steakhouse 55 (breakfast), Steakhouse 55 (breakfast), PCH Grill (breakfast and dinner), and Storyteller's Café (lunch). Downtown Disney District dining and merchandise – 10% off at Ralph Brennan's Jazz Kitchen (maximum discount of $40, excludes alcohol), Wetzel's Pretzels, and Alamo Rent a Car. Disneyland Resort Guided Tours – 15% off the "Welcome to Disneyland," "A Walk in Walt's Footsteps," "Discover the Magic," and "Cultivating the Magic" guided tours. +The Limited-Time Southern California Resident is valid for travel through May 23, 2019, excluding the spring break blockout of April 14–22, 2019. The price is the same for all ages 3 and older, and each ticket includes one Magic Morning entry when purchased in advance of the visit. You must purchase tickets by May 20, 2019. There is no fuse on this ticket. If you know of an offer that we've missed, please drop us an email with the details. If you know of an offer that you think most Members do not know about, please drop us an email with the details. Disneyland tickets may be used through December 18, 2019, excluding the spring break blockout of April 14–22, 2019. Active and retired U.S. military personnel can purchase Disney Military Promotional Tickets for themselves and up to five additional family members or friends. No more than six Disney Military Promotional Tickets may be purchased by any eligible member of the U.S. military (or spouse) pursuant to this offer. All tickets and options are non-transferable and must be used by December 18, 2019. Military discounts are valid for stays most nights from January 1 through December 19, 2019. Travel must be completed by December 20, 2019. Disney does not publish the actual discounted rates, and instead asks eligible U.S. military personnel to call (714) 520-7088 to check pricing, availability and to make reservations. In past years, the offer was generally 30% to 40% off, based on room category. Unlike the Walt Disney World version, the Disneyland offer allows the eligible service member to book up to two rooms, and allows their spouse (with valid and proper ID) to qualify in the absence of the service member. Eligible service members can purchase the Photopass Collection for $49 plus tax through December 21, 2019. The package includes digital downloads of all PhotoPass photos in the user's account when they redeem the voucher; a voucher for a dining print package, and a Disneyland photo disc with 350 stock photos from around the Disneyland Resort. Disney Military Promotional Tickets may be purchased at participating U.S. military sales outlets ONLY by Eligible Service Members (defined below) or their spouses (but not both), for use by themselves and other family members and friends, as provided herein. These Tickets may not be otherwise transferred, distributed or resold. Eligible Service Members are active or retired members of the U.S. military, including the National Guard, Reservists, the U.S. Coast Guard, the Commissioned Corps of the Public Health Service (PHS), and the Commissioned Corps of the National Oceanic and Atmospheric Administration (NOAA). The actual prices charged at the individual U.S. military base ticket offices for Disney Military Promotional Tickets may be less than the prices set forth above. Participating military sales outlets must require that Eligible Service Members (or their spouses) present valid military identification to purchase Disney Military Promotional Tickets. Disney 3-Day or 4-Day Military Promotional Tickets for admission to the Disneyland Resort expire and may not be used after December 19, 2019. Valid military identification will be required for purchase and use. No more than six (6) Disney Military Promotional Tickets may be purchased and (if applicable) activated by any Eligible Service Member or spouse (regardless of the place of purchase and whether purchased by that person or that person’s spouse). In addition, one of the six (6) tickets purchased must be used by the Eligible Service Member or his/her spouse. Each Disney Military Promotional Ticket must be used by the same person on any and all days. The Photopass Collection can be purchased only in person at Kingswell Camera Shop in Disney California Adventure, or at Main Street Photo Supply in Disneyland. Costco Travel Packages – many different travel packages including visits to Disneyland and Disneyland hotels are available through Costco. Disney's Resort Magic and Good Neighbor Magic Packages – these package includes accommodations in one of the three resort hotels or at one of 40 Good Neighbor hotels, along with theme park admission. The packages also come with a variety of extra inclusions and bonuses, usually a souvenir pin and lanyard, and discount coupons for various Downtown Disney merchants. Contact Disney Travel at (714) 520-5050, book on line. through the Disneyland website, or call your favorite travel agent to inquire about these packages. If you can't see the categories, please let us know by email (include which Browser and Operating System you are using)! MHP – Mickey's Halloween Party at Disneyland. Visit our Annual Passholders Blockout Dates page to see more dates. You can see future calendar schedules at Disneyland. As always, specifics are subject to change without notice (or occasionally, without us noticing) so when information conflicts between what is presented here and that presented by Disney, it is best to assume Disney's information is correct. Visit the Park Hours section of our Disneyland Park guide for additional details about Magic Morning and Toontown Morning Madness, including available attractions. Entertainment schedule: Go directly to the Disneyland Resort schedule for this week at Disneyland.com here. The Seasons calendar is published on the Disneyland website for the next eight to 11 months. 2) when I purchased the Dumbo sipper in Fantasyland (across from Red Rose Tavern) I was told I could only get the frozen lemonade or apple for my drink. I could not get a bottled diet coke. So your experience may be different.